Over the years, the Seaside Aquarium has partnered with many organizations that deal with the well-being of wild coastal animals. They have been the headquarters for the North Oregon Coast Marine Mammal Stranding Network for more than ten years and regularly work with the Haystack Rock Awareness Program. They also have worked with the Wildlife Center of the North Coast since its inception in 1999. 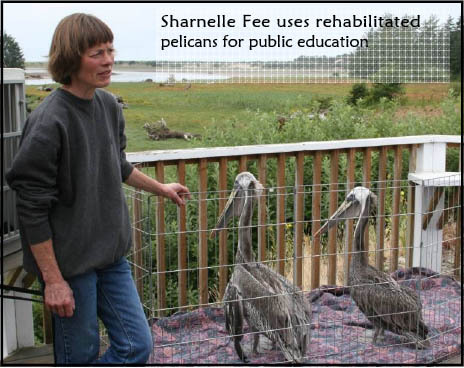 The Wildlife Center of the North Coast, based in Astoria, Oregon, rehabilitates injured wild native birds and mammals. This all-volunteer, private non-profit organization covers territory from the central Oregon coast (including Waldport) to southwest Washington. Sharnelle Fee, the Center�s director, sometimes drives hundreds of miles to pick up an animal or has one of her 70 volunteers who live all over the region bring it to her. With such a large area to cover, it sometimes becomes necessary to have a place for people to drop off an animal for retrieval. The Seaside Aquarium acts as an exchange point. The Seaside Aquarium often has at least one injured or traumatized bird resting safely in a box behind the scenes waiting to be taken to the Center and treated. Come to the aquarium and support two local nonprofits at the same time! Wildlife Center of the North Coast. When: March 1, 9am to 5pm. Drawings are from 10am to 4pm. March 1, 2009 the Aquarium will be holding an open house for the Friends of Haystack Rock. Admission is free but donations will be gladly accepted for the Friends of Haystack Rock. In addition, seal food can be purchased for $1 per tray; proceeds from seal food purchases go to the Wildlife Center of the North Coast. Come early and sign up for drawings for a variety of prizes. Drawings will be held from 12-4. You don�t need to be present to win. The Aquarium has a long history of helping with the rescue of injured birds. In 1941 a murre was brought to the aquarium with an injured wing. Named "Gus", this bird not only became one of the exhibits, but also a mascot of sorts, following the manager through the Aquarium. For many years, coastal seabirds were part of the displays. The practice of taking in injured animals ended in the 1970�s. Instead, the Aquarium currently involves itself by connecting animals with licensed rehab facilities, responding to marine mammal calls, and public education. The Wildlife Center rehabilitates animals and then reintroduces them to the wild. If an animal can not be released, it is used as part of a public education program. For more information on the Wildlife Center of the North Coast or to donate, visit www.coastwildlife.org. If you find an injured bird, page the Injured Wildlife Helpline at (503) 338-3954.